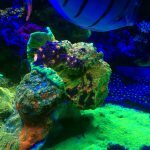 Anyone who has had a reef related conversation with me over the years has probably learned that the thing I consider the most important in this hobby is regular water changes. I’m always scanning boards, reading articles, looking for the newest thing to bring my tank to the next level. I have a closet full of additives that don’t work, bins full of parts for all sorts of devices that were supposed to make the tank run better, and still at the end of the day, a good water change beats them all. Based on what I have read, all those fancy tanks in Germany with strange methods like Zeo, ULNS, balling, probiotics, you know them, those tanks that are front to back DENSE SPS with incredible coloration? Guess what, the one thing they have in common is that their owners keep up with regular water changes. You will not find a tank of that level of quality that does not do water changes regularly. Me on the other hand, I live in a small NYC apartment and all of my tank stuff is already all over the place, so having buckets of water in my living room for a day or two has never been very appealing. I’ve often gone months without doing water changes with really no noticeable effects, but my tank never really got to the level that I wanted. So about 6 months ago I started working on some major changes to my tank that would allow me to do more frequent changes without making a mess in my home. The end state was clear, a simple system that could easily allow me to mix, change, and then dispose of old water without a bucket on the floor. After a few major plumbing changes, I had all of the tools needed to accomplish this feat, but the centerpiece of the project was still missing. How could I create a set of logic gates to control the flow and movement of water while protecting my apartment and my tank from potential disasters? I spent many nights thinking up ways to eliminate points of failure, but the system became more and more complicated. Finally, the answer hit me right across the face while browsing a local website, a banner, like a beacon of light, advertising “Automated Water Changes”. 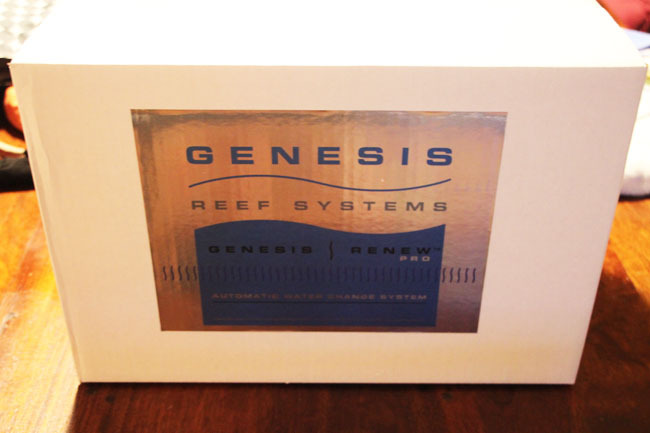 The ad was for the Genesis Reef Systems – Renew: Automated Water Changer. I read everything I could about it but still could not picture it in my mind or how it worked. I decided to give it a shot. 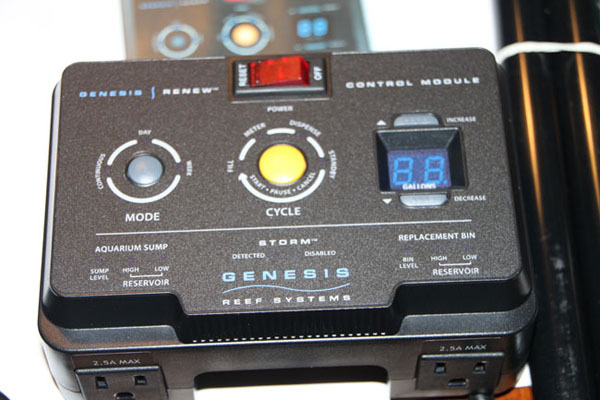 Note: Genesis Reef Systems provided a test unit for this review. Like any gadget junkie, I immediately broke open the box and laid out all of the parts. This is everything that comes with the Pro version of the Renew. Note the inclusion of the additional float checks and tubing to mount them in your sump and mixing bucket. These parts are optional. The heart of the system is the central control module pictured above. This is accompanied by two metering buckets. From just looking at the construction of the buckets I knew I had hit pay dirt. 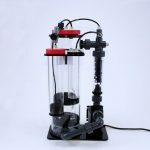 Finally, a company spent time and engineering resources developing the best method to do regular changes with extremely low risk of flooding or drying out pumps. For example, take a look at the outlet system from the bottom of the metering bucket. The reservoir is well built and fairly easy to understand. This is how the metering buckets work. One the inside of each bucket there are TWO float check valves and two standpipes. The standpipes run to the bottom of the bucket and you attach hoses to both of them. Both hoses go into the same location (for one reservoir both hoses go into your water mixing bucket, and the hoses on the other reservoir go to your sump). One tube for each reservoir has a pump connected to the end. 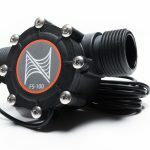 The pumps are connected directly into the control module, this allows for you to use your preferred pump or whatever you need to get through the hose into the metering reservoir. 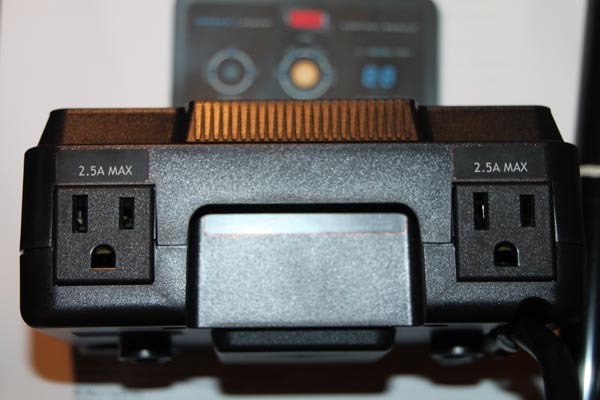 The system turns on the pumps by way of two 110V outlets on the bottom of the controller: When a cycle is started, the central controller turns on both pumps. In each bucket you can see the water coming up through one of the standpipes and falling into the bottom of the reservoir. First the water rises above the bottom check valve, which causes a blue light to go on on the front of the controller. As the water nears the top of the second standpipe, water begins to flow back where it came. This ensures that if there is a problem, water will just flow back into the the bucket/sump that it came from. So the water has filled the reservoir and is flowing into the second standpipe. The top of the water line in the reservoir measures a perfect gallon. An 1/8 of an inch above that and the second check valve is tripped. When this is tripped the system turns off the pump and waits. Both reservoirs need to be filled to the point where the valve is turned on. When the system senses both checks are floating and it has waited a certain period of time, it enters the Meter mode. This is basically just a timeout for the system to check all conditions and make sure each bucket measures the proper amount of water. The system will sit in the Meter mode for several seconds and then with a click it will enter Dispense. 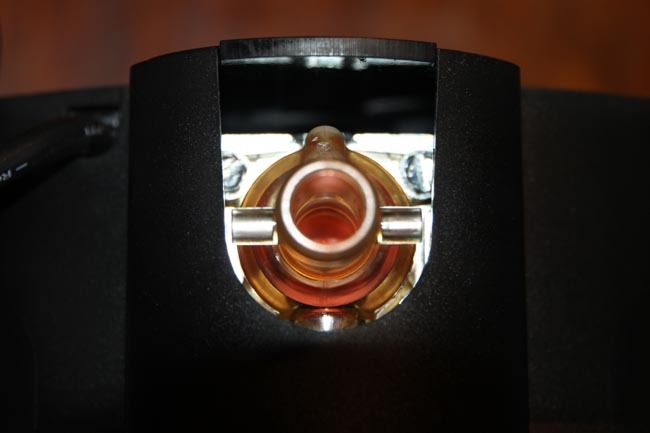 The Dispense mode essentially opens both solenoids on the bottom of the reservoirs. Water from the “replacement” reservoir flows into the tank, this is the new water that will enter the aquarium. Water from the “tank” reservoir flows out the tube into whatever you are using for waste water. In my case I plumbed this line directly into a condensation pipe in my apartment that allows for water to trickle out of air conditioners. 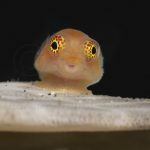 It is suggested that the hose bringing the new water into the aquarium is in a location in the sump where the water will have sufficient time to mix with the existing water to eliminate and salinity/pH/temperature shock on the tank inhabitants. My water mixing bin is right next to my chiller, so the exhaust from that keeps the new saltwater at around 75 degrees so there is no issue with temperature differentials. The system can be set to dispense in three modes, Daily, Weekly, or Continuous. Daily mode dispenses a set number of gallons every day. Continuous dispenses one time until the desired level is reached. 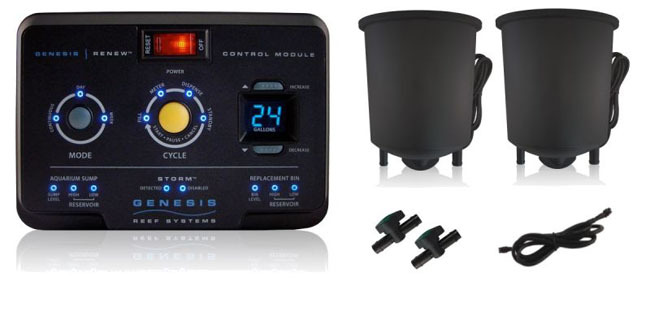 You control the number of gallons for each mode through the digital readout. For example, I have mine set to “1” Daily, which means every day I swap out 1 gallon of water for a 140G system. For spot water changes, I switch it to continuous and hit the button until it reads 15G (this is the metered limit of my replacement water holding bin). If I start a 15G Continuous cycle, the system will change 1G of water 15 times. Right now some people are about to unleash a storm of fractions and 6th grade mathematics on me, so for the record, yes this is not the same as a total 15G change. With the amount of water in my system it is slightly more than 14G depending on the flow rate of the tank/sump. I’m not going to get into semantics, if you want a 15G change, do a 16G change. The ability to standardize on a 1G changing reservoir allows the system to scale up as high as you want. If you have enough room you turn it up to 99 and pour yourself a drink and relax while the Renew does your entire water change for you. It is that simple. If all of these parts and tubes sound complicated, it is. That is until the first time you see it run. Having done a little bit of troubleshooting (which I will explain in the second part of this review) I can tell you that watching this thing work is CRAZY FUN. 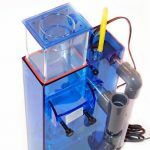 Gone are the days of bringing out large buckets, turning pumps and skimmers off, siphoning out the waste water (which many corals were exposed and put out a good deal of slime), waiting for the water to get pumped back into the tank, disposing of the water, etc. Think about how long it takes and how much more you might do it if it was easier, or dare I say it, fully automated? You are going to have to wait for Part 2 of this review to hear how the system performs over the course of a month. Now just to save my pennies!!! 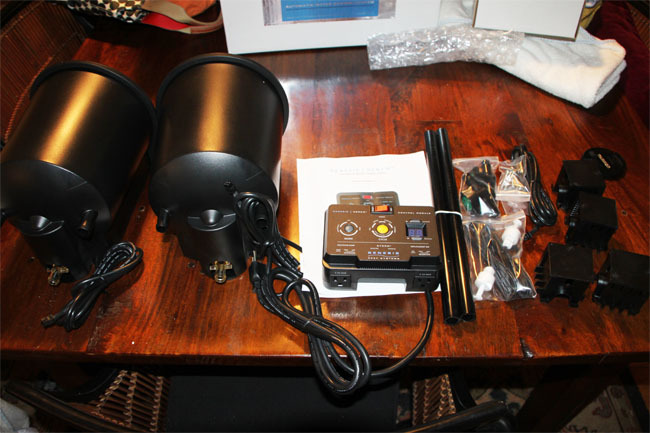 I hope to see pictures of how this thing is mounted and plumbed together with your reef system. As thirty5 says, the website is really lacking. The level of information that they provide on their website is completely inadequate for me to spend so much money on any of their units. I want to know what I’m getting inside and out- so please post as many pics as you can. Thanks for the review!